This article shows you that how to install and configure Openstack Neutron Networking Service on CentOS 7 (Controller node). In the previous posts, we have covered the below topics which also a main part of the whole Openstack Deployment. Refer those links also to understand this topics from beginning. 2. Install Openstack Liberty Packages on node1 and node2. 3. Install and Configure MariaDB(MySQL) Database on node1 and node2. 4. Install and Configure RabbitMQ Message service on node1. 5. Install and Configure keystone for Identity service on node1. 6. Install Glance for Image service on node1. 7. Install Nova Computing on node1 and node2. 8. Install Neutron for networking on node1 and node2. 9. Install Horizon for dashboard on node1. 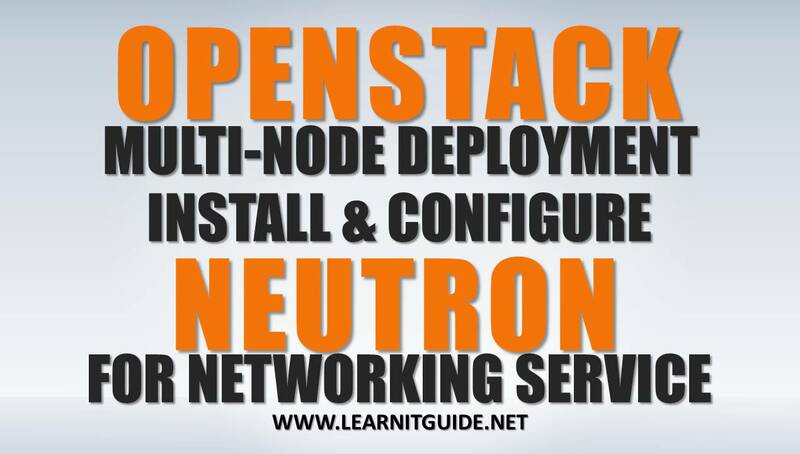 Continue with the previous post, we will explain you how to install and configure Neutron Openstack networking components on controller node (node1). Basically, OpenStack Neutron is also a important component in openstack and a networking-as-a-service project within the OpenStack, which allows us to create or attach network interface device to networks. 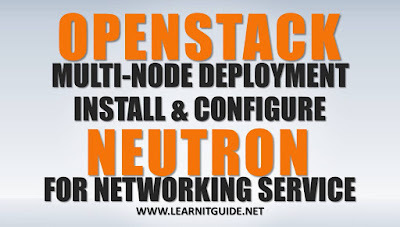 Neutron creates networking virtualization in openstack environment and it manages the Virtual Networking Infrastructure, it provides the networks, subnets and router object abstractions. Earlier, neutron was called as quantum, later on it has been changed to neutron due to some trademark name conflict with other company. Server Names : node1 and node2. Make sure each hosts are reachable. I made an entries in hosts file only. Verify the internet connection, because we use public repo's to install these components. Take a backup or snapshot at different stages to restore in case of failure. Disable Selinux and Stop firewall to avoid issues during the installations (systemctl stop firewalld ; systemctl disable firewalld) or allow each component services on firewall after installations. Installed and Configured MariaDB(MySQL) Database. Installation and Configuration of Neutron networking service on Node1 (controller node). Login into 'node1' and create neutron database to store its data. Replace 'node1' with your controller node name and replace 'redhat' with your Database Neutron password you wish to set. Create the neutron user and add roles. Replace 'node1' with your controller host name. Before configuring the neutron service, We must choose any one of the following network option to configure services specific to it. Simplest possible architecture that only supports attaching instances to public (provider) networks. No self-service networks, routers, or floating IP addresses. Only the admin or other privileged user can manage provider networks. This is option 1 with layer-3 services that support attaching instances to self-service (private) networks. Additionally, floating IP addresses provide connectivity to instances using self-service networks from external networks such as the Internet. We go with option 2 in this post, self service networks. Install and configure the Networking components on the controller node. Install the required packages of Neutron Network component on controller node. Edit the /etc/neutron/neutron.conf file and make the below changes. Replace 'node1' with your controller node name and replace 'redhat' with your Database Nova password you have set before. Make the following changes in the DEFAULT section to enable and configure the Modular Layer 2 (ML2) plug-in, router service, overlapping IP addresses, RabbitMQ message queue access, Identity service access, Networking to notify Compute of network topology changes, lock path. Replace 'node1' with your controller node name. Configure RabbitMQ message queue access in the [oslo_messaging_rabbit] sections as below. Replace 'node1' with your controller node name and replace 'openstack' and 'redhat' with the username and password you have set for the openstack account in RabbitMQ configuration. Replace 'node1' with your controller node name and replace 'neutron' with the username and password you chosen while creating the neutron user. Replace 'nova' with the username and password you chosen for the nova user in the Identity service. The ML2 plug-in uses the Linux bridge mechanism to build layer-2 (bridging and switching) virtual networking infrastructure for instances. The Linux bridge agent builds layer-2 (bridging and switching) virtual networking infrastructure for instances including VXLAN tunnels for private networks and handles security groups. Edit the /etc/neutron/plugins/ml2/linuxbridge_agent.ini file and make the changes as below. Replace 'enp0s8' with your physical public network interface of node1. Replace '192.168.2.1' with the IP address of the physical network interface that handles overlay networks. The Layer-3 (L3) agent provides routing and NAT services for virtual networks. Edit the /etc/neutron/l3_agent.ini file and make the below changes. The DHCP agent provides DHCP services for virtual networks. Edit the /etc/neutron/dhcp_agent.ini file and make the below changes. The metadata agent provides configuration information such as credentials to instances. Edit the /etc/neutron/metadata_agent.ini file and make the below changes. Replace 'node1' with your controller host name and replace 'neutron' with the username and password you chose for the neutron user in the Identity service. The Networking service initialization scripts expect a symbolic link /etc/neutron/plugin.ini pointing to the ML2 plug-in configuration file, /etc/neutron/plugins/ml2/ml2_conf.ini. so lets create it. Enable the services to start when the system boots. Also download 100% free eBooks related to OpenStack Cloud. More topics will be added soon. stay connected with us on social networking sites and Subscribe our YouTube channel for more updates.